St. Clairsville, OH (February 22, 2018) — Local middle school students recently competed to test their math and problem solving skills at the 2018 MATHCOUNTS competition. The event, held at Belmont College in St. Clairsville, was held on Friday, February 16. Ohio Registered Winners Photo Caption: Bellaire Middle School team, coached by John Farrier, took first place at Belmont College’s 2018 MATHCOUNTS competition and will proceed to the state competition in Ohio. Pictured left to right: Chance Maffe; Logan Carpenter; Tyler Edgar; and Caitlyn Silber. More than 85 competitors from 6 area schools participated in the event, including students from: Bellaire Middle, coached by John Farrier; Harding Middle, coached by Melissa Bowers, and River Elementary coached by Laura Dotterer in Ohio, and Follansbee Middle, coached by Stephanie Humienny; Triadelphia Middle, coached by Scot Kangisser, and Wellsburg Middle coached by Elizabeth Jeffers in West Virginia. MATHCOUNTS encourages students to put their math and analytical skills to work to solve real-world problems and scenarios in competition with their peers. For more than 30 years, volunteers, educators, and industry sponsors have come together to make MATHCOUNTS possible for middle school students around the country. The event includes both individual and team competition. Belmont College has hosted the math enrichment competition for more than 20 years. WV Registered Winners Photo Caption: Triadelphia Middle School team, coached by Scot Kangisser, took first place at Belmont College’s 2018 MATHCOUNTS competition and will proceed to the state competition in West Virginia. Pictured left to right: Grant Kenamond; Kathyn Prather; Chloe Holmes; and Jonah Nizami. 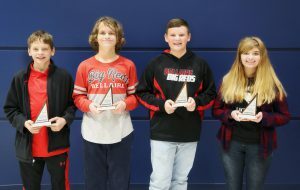 Registered local winners proceed to state competitions, where the top four “mathletes” and their coach compete to represent their state or region at the national level. The Ohio State Competition is on March 10, 2018 at Columbus State Community College in Columbus Ohio and the West Virginia State Competition will be held on March 24, 2017 at Braxton County Middle School, Flatwoods, West Virginia. Non-registered winners compete only for medallions at the local event. At all levels, MATHCOUNTS challenges students’ math skills, develops their self-confidence, and rewards them for their achievements. 1st Place Team: Bellaire Middle School Team: Logan Carpenter; Tyler Edgar; Chance Maffe and Caitlyn Silber. 2nd Place Team: Harding Middle School Team: Jonathan Burchfield; Corryn Lahr; Dylan Lewis; and Mason Stoll. 1st Place Team: Harding Middle School Team B: Bryce Huff; Parker Kelley; Kellen Marshall and Daniel Sheeler. 2nd Place Team: Bellaire Middle School Team C: Bryton Giffen; Tyce Hughes; Isaac Salva; and Devin Schramm. 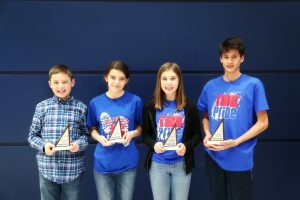 1st Place Team: Triadelphia Middle School: Chloe Holmes; Grant Kenamond, Jonah Nizami; and Kathryn Prather. 2nd Place Team: Wellsburg Middle School: Brianna Ferguson; Kendrick Fish; Eddie Marks; and Brody McAllister. 2nd Place Team: Triadelphia Team D: Luke Dunaway; Adam LaFollett; Summer O’Bryant and Gideon Titus-Glover.